What do students really think about tuition fees? This month, I have spent time at both Edinburgh Napier University and the University of the West of Scotland as well as various English universities and I have also recently penned a new publication on tuition fees. So I have been mulling over the different student finance systems in place in the four parts of the UK. Each year, as part of the HEPI / HEA Student Academic Experience Survey, we ask thousands of full-time undergraduate students who should pay for the costs of teaching. Their views are not as simple as might be expected. The first thing that stands out are the relatively small differences between the four parts of the UK. These are smaller than might be expected, given the different funding regimes and political contexts. 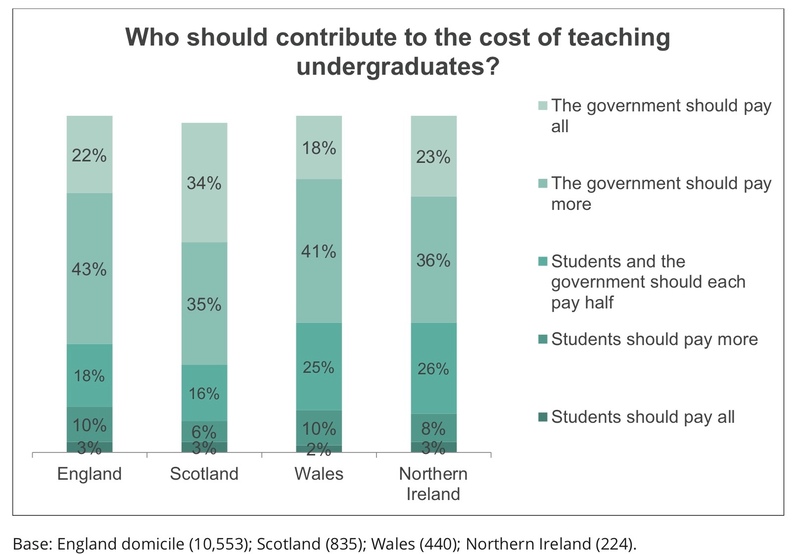 While Scotland stands out a little, particularly in relation to the relatively high proportion of students who think the Government (or taxpayers) should cover all of the costs, the other three parts of the UK provide fairly similar results. 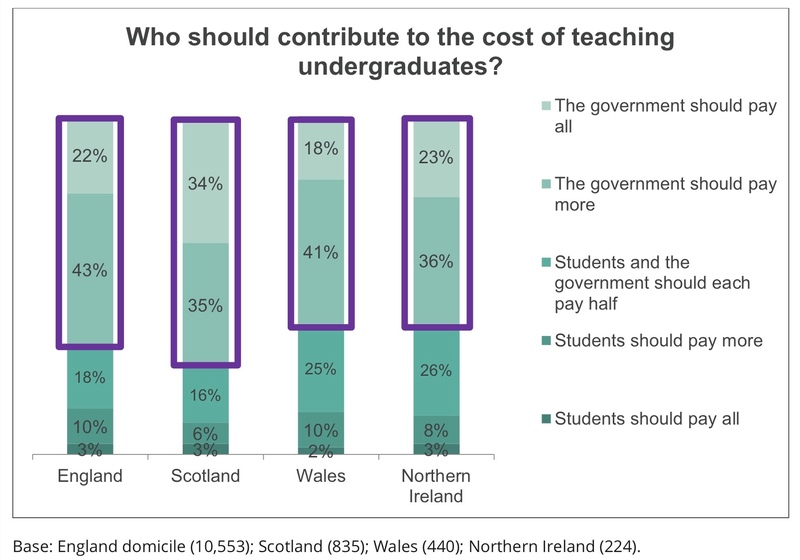 The second thing that stands out for me is that most students in all parts of the UK think the Government (or taxpayers) should pay all or more than half of the costs – marked in purple below. However, the same chart can be read in a very different – but equally accurate – way. 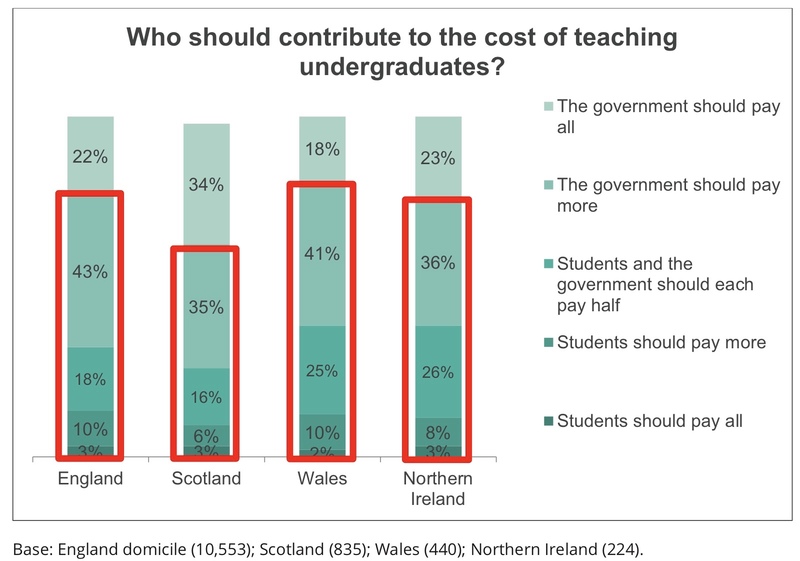 A majority of students in all parts of the UK, including Scotland, also think students should pay towards the costs (as shown in red below). Thought the UK, only tiny numbers of students think they should cover all of the costs themselves. So the one – and perhaps only – thing that is certain as the new Post-18 Education Review gets under way in England is that students seem overwhelmingly to back mixed-funding models.